When you remodel your kitchen, the old cupboards can be reused to organize other places in your home. 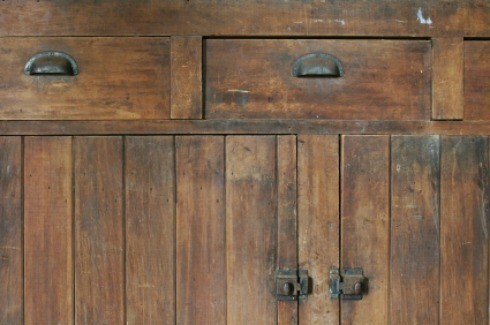 This guide contains uses for old kitchen cabinets. If older houses are being rehabbed around you, look out for old cabinetry being tossed out. Those pieces were sturdily made of good wood, and can easily be made into furniture for you! I have an eye on an oak bookcase taken out of my apartment building, and I have turned an oak counter (for a kitchen?) given to me at the end of a yard sale, into a narrow buffet for the dining room. Instead of spending hundreds on garage organization, I got kitchen cabinets from someone who was updating on freecycle, painted them white to match my garage and lined them up against the walls which already had built in cabinets by previous owner. Or look for 'offered' shelving, cabinets, dressers etc on the freecycle.org group. Great way to organize without spending a fortune.